In the first half of the fifth century, the Latin-speaking part of the Roman Empire suffered vast losses of territory to barbarian invaders. But in the Greek-speaking half of the Eastern Mediterranean, with its capital at Constantinople, there was a stable and successful system, using Latin as its official language, but communicating with its subjects in Greek. 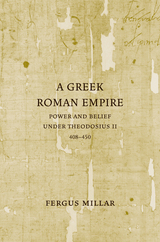 This book takes an inside look at how this system worked in the long reign of the pious Christian Emperor Theodosius II (408-50), and analyzes its largely successful defense of its frontiers, its internal coherence, and its relations with its subjects, with a flow of demands and suggestions traveling up the hierarchy to the Emperor, and a long series of laws, often set out in elaborately self-justificatory detail, addressed by the Emperor, through his officials, to the people. Above all, this book focuses on the Imperial mission to promote the unity of the Church, the State’s involvement in intensely-debated doctrinal questions, and the calling by the Emperor of two major Church Councils at Ephesus, in 431 and 449. Between the Law codes and the acts of the Church Councils, the material illustrating the working of government and the involvement of State and church, is incomparably richer, more detailed, and more vivid than for any previous period. Fergus Millar is Emeritus Professor of Ancient History at the University of Oxford. He is the author of The Roman Republic in Political Thought (2002), The Crowd in Rome in the Late Republic (1998), and The Roman Near East 31BC – AD 337 (1993).